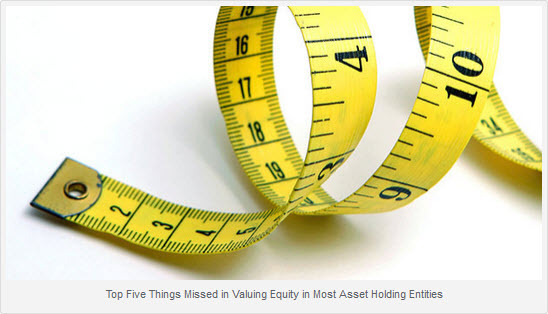 This article addresses what is often omitted from most asset holding entity valuation reports. By failing to include issues like the ones outlined, the resulting adjustments are less empirical and more a "guesstimate". Valuation practitioners and their advisory clients have a duty to the users of our reports to accurately address equity level risks. The days of applying Mandelbaum and referencing a few IPO and restricted stock studies are over. The foundational premise of business valuation is the identification of risk and economic benefit to notional investors. Yet, somewhere along the way, there has been an over-simplification by valuation, tax, and legal professionals of how to identify and measure risk. Currently, most Asset-Holding Entities (corporations, LLCs, partnerships, and trusts) have certain investments and have been formed for asset protection, tax minimization, and unitization (creation of equity in the entity versus direct ownership). What often follows is a determination of the fair market value of the underlying assets and liabilities-then the adjustment of pro rata value (of units/shares/interests) to reflect investor concessions due to impairments or advantages associated with holding the equity, commonly referred to as "discounts" and/or premiums. "Which is better? To have a detailed, thorough report with robust valuation analytics, or a "cookie cutter" report that fails to adequately reflect what are keys to a valuation opinion: risk and economic benefit." For the purpose of demonstration, we will examine the Smith Partnership, where a 10 percent equity interest has a pro rata value of $5 million (pre-adjustment). There are several 10 percent and 20 percent interests and a single class of LP interests. The LP has been operating for 12 years. There is currently $20 million in debt (which means the $5 million capital account of the 10 percent is after a reduction of $2 million). The debt was financed for 15 years at a rate of 5.5 percent. The property held is a shopping center with two anchor clients. The 2013 net operating income is $578,000. The capitalization rate used by the real estate appraiser was 8.25 percent. The yield on a pro rata basis would be $578,000/$5,000,000 (11.6 percent) and annual distributions have been $525,000 (10.5 percent). Common practice would involve the valuation analyst going through the process of applying adjustments to the non-controlling interest for lack of control and lack of marketability/illiquidity. S/he then arrives at an aggregate discount of between let's say 30 percent and 35 percent. While this may be sufficient for the client's accountant to file the gift tax return and for the T&E attorney to advise the client, this "commodity" approach raises the question of whether there is more that can be done to enhance the valuation report's validity for the taxing authorities. Issue #1: Did the valuation analyst read the real estate appraisal report cover to cover or simply drop the market value findings and begin the process of opining on the discounts? If s/he had, the analyst may have determined: (a) heavy emphasis on the sales comparison (market) approach, as the shopping center was not collecting market rents; (b) the title to the property was in the Smith Family Trust; (c) the assessed value of the property was $85 million versus the $70 million-opined by the real estate appraiser- suggesting a likely reduction in property value and a missed opportunity of the partnership's GP to file for a tax assessment; (d) there is no indication the GP or his/her advisors had explored a cost segregation study; (e) while certainly not all inclusive, the indicated marketing period is 12+ months; (f) there was a former gas station contiguous to the property; and (g) one of the anchors and half of the 25 tenants' leases were due to expire in 2014. These issues are all equity-level risks rarely addressed, with the minority interest holder usually incapable of mitigation. Issue #2: Did the valuation analyst consider the holding period of the investment; the size of the pool of likely (accredited investors) to invest in a $5 million interest; the yield and the capital appreciation of the underlying assets? Clearly, the holding period is longer than most real property investments, and since the property value was presumably higher in the past by at least $15 million, an opportunity cost was incurred. In addition, there may or may not be the ability to take a section 754 election (stepped-up), and one may need to know whether a 1031 exchange has occurred in the past where there is a potential embedded gain liability. By knowing the basis, one can also often determine what the annual appreciation or decline in the underlying asset value has occurred. This can be combined with yield to develop a total return (which is what many investors consider). Common theory to minimize concentrated risk is to put no more than 10 percent of one's investment in any asset class (issue of allocation). If this holds true, how many individuals worth $50 million exist, and how many would be willing to invest in an illiquid privately held entity with no control? These above issues are often overlooked. Issue #3: While tax reduction can be a reason for creating an asset holding entity, it cannot be the primary one. Therefore, what information can be culled from the LP operating agreement and what may be missing? Sometimes, provisions indicate that just because the underlying asset is sold, the GP is not obligated to distribute the net proceeds. Often, there are provisions addressing rights of first refusal and the due diligence required before a transfer is permitted, which can take from up to 6 to 18 months before a transfer and/or a sale could occur. This goes to time-value of money (opportunity costs). In many cases meeting minutes do not exist, which could help avoid 2036(a) issues involving a legitimate business purpose. This could be something as straightforward as an investment policy statement indicating the time horizon and expected returns of the investments, which is clearly what most traditional investment offerings outline. This can help strengthen the argument for the existence and level of impairments. Also, certain provisions indicate that at the time of death or transfer the LP interest becomes an assignee interest, which is an economic interest with no voting rights. This can be highly relevant when the equity block may be 50 percent or more. Issue #4: Investments are dynamic. How can discount adjustments be static? Since cost of capital, trade volume and velocity and volatility are not constant; how can the application of discounts from most historic studies be used without discussion of the same? While not the only means to do so, examination of short- and long-term U.S. Treasuries can often capture these risks without the myriad of variables that also impact risk. Stated another way, if discounts were not greater from 2008 through 2010 due to the dramatic market decline and strength of REITS, then the work product might understate the discounts. One must also consider the impact on leveraged property. Issue #5: Are the discounts reasonable? Let's assume the long-term return on REITS is 12 percent to 15 percent with 5 percent to 8 percent of that being yield and the balance capital appreciation; it stands to reason that the class of investor seeking similar risks and returns would expect the same or better for a far more illiquid investment with no secondary market and concentrated risk. We know the LP distributed yield is 10.5 percent, which is generally much better than its asset class. If we determine the compounded growth rate was 5 percent, we can assume total return is close to 15.5 percent, which is on the high side of REITS. By discounting the LP interest by, say, 30 percent for lack of marketability/illiquidity, this creates a 22.1 percent return BEFORE application of any impairments that may be appropriate for lack of control. The real question that should be asked is, given the level of yield and underlying asset performance, why would a rational investor make concessions this high? Clearly, the above issues are not all inclusive, but do demonstrate why the tax authorities might challenge the adjustments made by valuators who simply take the pro rata value and apply boilerplate references to dated IPO and restricted stock studies, instead of capturing the notional investor return expectations. This is the difference between a meaningful work product and an expensive paperweight. If it doesn't always mean more tax savings for the client, it does mean that sometimes a 15 percent total discount may be too high and that a 75 percent discount could be too low. Which is better? To have a detailed, thorough report with robust valuation analytics, or a "cookie cutter" report that fails to adequately reflect what are keys to a valuation opinion: risk and economic benefit. Carl Sheeler, PhD, ASA, CBA, AVA, has over 25 years of public and private company experience with business disputes/disruptions and well as transfers, transactions and transitions associated with Intergenerational Planning, Equity Transfers with Estate and Gift Tax issues, as well as Partial and Full Liquidity Event Options.